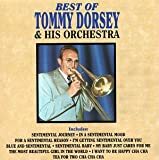 No biography of Tommy Dorsey, known as “The Sentimental Gentleman of Swing,” is complete without brother Jimmy because their careers entwined or overlapped throughout their lives. They were born in the coal country of eastern <?xml:namespace prefix = st1 ns = "urn:schemas-microsoft-com:office:smarttags" />Pennsylvania--Jimmy on February 2, 1904, and Tommy on November 19, 1905. Their father was a miner and self-taught musician who eventually left the mines to teach music. He was a hard taskmaster who insisted that his boys learn all the woodwinds and brass instruments, giving them a ticket out of the mines. The boys’ first band, the Wild Canaries, was regionally popular and even played Baltimore in 1921. They honed their skills in the bands of Jean Goldkette and Paul Whiteman and were always working--on the New York recording scene, in pit bands, and on radio. In 1928 they organized the Dorsey Brothers Orchestra to record with Bing Crosby, among others, and many of their sides charted. The “Battling Brothers” had fought, often violently, since childhood and mostly about music. 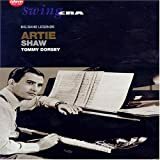 Jimmy was easy-going, but Tommy had a hot temper, and as Artie Shaw observed, “...Tommy was intent on being the boss man.” On May 30, 1935, Tommy walked off the bandstand. Jimmy stayed with the DBO, which became Jimmy Dorsey and His Orchestra, and Tommy took over Joe Haymes’ band, calling it Tommy Dorsey and His Orchestra. In his book Tommy Dorsey: Livin’ in a Great Big Way, Peter J. Levinson says, “Fundamentally, Dorsey was looking to offer the public a sweet-sounding dance band with a strong sense of melody.” By 1938, as a result of chart-topping record sales and successful personal appearances, Tommy’s band was leading the polls. Jimmy’s band was doing well on the West coast, performing with Bing Crosby on the Kraft Music Hour. Despite personnel changes over the years, Tommy always had top-notch instrumentalists, vocalists, and arrangers--the list of which reads like a “Who’s Who.” He launched the career of Frank Sinatra who said that he learned from Dorsey how to “play” his voice. An astute business man and a dapper dresser, Tommy furthered his career through movies (as a contract player at MGM) and radio (as musical director for Mutual Radio Network). In 1945 his virtuosity on trombone led to performances with symphony orchestras. As interest in the big bands declined, Tommy got a boost in 1950 from his friend Jackie Gleason who featured the band on TV. In 1953 the brothers joined forces again, naming their band The Fabulous Dorseys after a film they’d made in 1946. The band debuted on Gleason’s top-rated Saturday night TV show and became Gleason’s summer replacement on Stage Show. The variety show, which the Dorseys hosted through 1956, featured stars from Count Basie to Elvis Presley. Two weeks before Tommy’s death the brothers recorded “So Rare” which triggered another fight, Tommy accusing Jimmy of selling out to rock ‘n’ roll. Neither brother lived to see “So Rare” become a gold record. Tommy died suddenly on November 26, 1956. Jimmy, devastated by the loss of his brother and suffering from cancer, died on June 12, 1957. Says Levinson, “The combined number of hit records amassed by the Dorsey brothers remains astounding to this day: a total of 286 top-forty Billboard Pop Chart records.” In 1966 the brothers were commemorated with a U. S. Postal Service stamp. Tommy Dorsey Frank Sinatra "The Song Is You"